One of my students recommended this book to me. He is what we call a “reluctant reader” so I was excited to read it. I don’t know how to tell him that I did not really like it much. The fact that it took me ten days to read is a testament to how I had to drag myself through it. He kept on telling me that it would get better, but I never found that the case. The world of Deepgate is a dark one. I’m all for dystopian societies. Usually they are the settings for my favorite books. The description of the city was detailed to start out. There are chains everywhere, supporting buildings over the Abyss. I never quite figured out what was holding the chains up, but maybe it was because I didn’t read closely enough. I really didn’t care. The problem that I found with the explicit detail is that it felt like a broken record to me. Just as the story started revving up, there was a description of the horrible living environment. It was more distracting than helpful. Campbell jumps right in to the story without much exposition. Normally I like that, too. However, he also jumped in with a completely different vocabulary with no explanation of what the world-words meant. I guess it is a good exercise in contextual reading. I spent the first few chapters trying to figure out exactly what was going on and why it was going on. Characters were tossed in as if the author expected us to already know who they were. I kept on checking to see if this was a book 2 of a series. The main characters were superficial. There was no depth to them. Campbell kept hinting at a deeper story, but never told it. I know that this is a method to increase anticipation and interest in a novel. The thing is, you’ve got to stop being a tease and give the information. The first book in a series should make you want to read the second book. 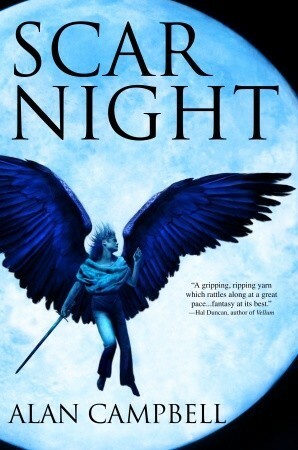 I just let out a sigh of relief when I was done, ready to move on to a more interesting book and forget that I ever read Scar Night. I gave it 2/5 stars on Goodreads.